Yesterday, Dawn, Xander, and I had a very brief visit to Santa Rosa. It was great to see everyone again and James and Ron took a look at my Starfire to see about getting it quieter. Diagnosis: hum cancellers work best mounted on the front and copper foil shielding creates problems when it's inside the body (Ron explained why shielding can also cause problems, as well as fix problems, but it would take too long to get into here). So, a hole will be routed and mounting will commence. Mica gave me a quick tour of what's going on there and there is soooo much happening. I don't think I've ever seen so many instruments in production before. And, the quality is better than ever. There are some really stunning basses and guitars in production. I didn't get to play any of them because we only had a few minutes before we had to race to the airport. But they sure looked great! There are going to be some very, very happy people out there. 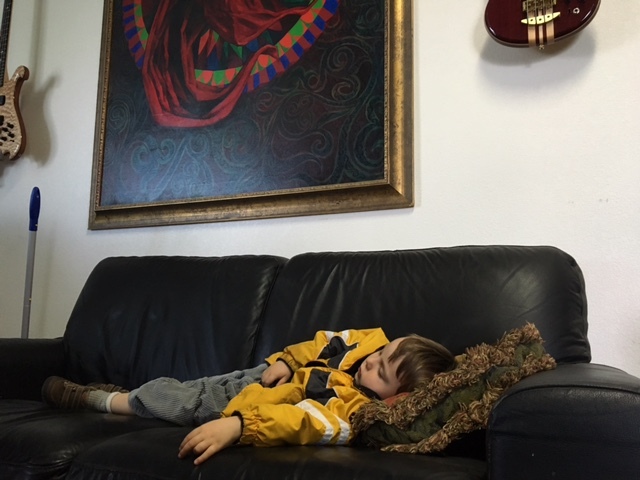 "Yeah Dad, basses, you play them, these folks make them . . wake me when they bring out some cookies". Sounds like you had a great weekend. I was wondering how you handled your bass with the airlines? Did you check it or carry it on? If checked, did you use its typical case and were there any issues? Looks like Xander was soaking up the energy of the place. Funny you should mention that. I have a Calton case for it. I checked the weight and it came out to about 30lbs. No problem. We were flying United. Then, the night before we left, I checked their website and it said anything over 62 linear inches gets charged as oversize, which is a $200 upcharge! So, I thought about just leaving it at home, but I really wanted to bring it, so I decided to just give it a shot. I left Dawn and Xander at the check in and went to the park the car. When I called her from the shuttle bus to find out where to meet, she told me everything was checked at it was only $25! Apparently the staff was very helpful as she was wrangling all our stuff plus Xander. And he also played a role in charming them. So, I had thought it was going to be $400 extra to bring it, but it turned out to be $50 total. Sadly, Calton has apparently had issues since the founders sold the company. Mica said they'd talked to them a while back about getting some Alembic cases made, but they refused due to the length of the instruments. I'm not sure who I would recommend at this point, short of Jan-Al, who do make fantastic Anvil style flight cases. Those definitely put you over the weight limit, though. I just looked up Calton, though, and it seems that they have moved the company to the U.S. and are making a big effort to get it together. It would be great if the quality has returned, because they really are among the best of the best. I have no qualms about what happens to the bass inside that case. I guess pictures are in order (I think Harry took some, maybe he can post them?). I will also say that if you choose to have a custom case made by Calton or similar, be very careful about the template. 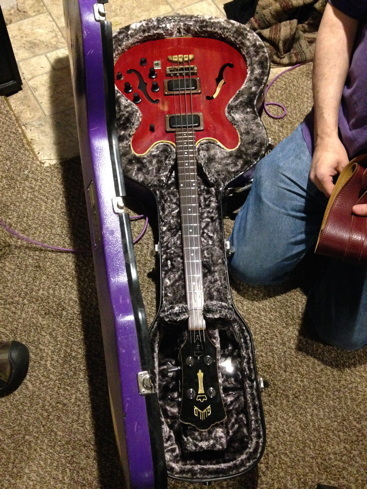 The Starfire was done with an archtop guitar template. I placed the order through The Olde Town Pickin' Parlor in Arvarda CO. The guy who did it was casual to the point of arrogance. He insisted he knew how to do it and had done dozens of them ("Are you sure that's right? ""Shut up, kid, I know what I'm doing."). I had a bad feeling about it and called Calton and sure enough, he'd screwed it up big time. So, I did the template all over again and it came out perfectly. Had I trusted this guy, it would have not fit and been another 6 month wait. I would loved to have carried it on, but there's no way it would fit in an overhead bin. Best living room there ever was. 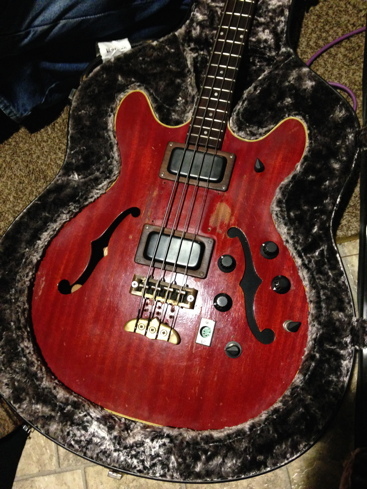 Nice photo of your bass in the Calton case under your mini gatherings thread. Calton cases are pricey, but they look like they would protect well. Ideally, if I *could* break away and go, I'd take my Persuader 5 back the the Mothership for a check-up and an E-M-W update to match my Custom fretless. Come to think of it, that oughta' be reason enough right there! And I hear the couch is great for a nap! Here's the Starfire resting in its case - same pic as in the mini-gathering thread, but unedited/unfiltered. Edwin, glad you made it to the Mothership! Sounds like a quick trip but I'm sure it was worth it! Hope you can make it to the Gathering in May - unfortunately I am pretty busy that day but will try and swing by at some point!